Still Bill debuts tonight on Showtime at 8:30 p.m. Eastern. Most popular artists do their most enduring work in the space of a relatively short span of time. Having made their mark, they've then earned the right to hang around forever, using their fans' memories of their better days as a meal ticket while hoping that something—a biopic, a remake, a fluke occurrence like the "In Dreams" scene in Blue Velvet—will reconnect them to the zeitgeist. It's a rare thing for a performer who's clawed his way to the top to just walk away while the iron is hot, or even lukewarm. A few years ago, when Dave Chappelle pulled the plug on his Comedy Central series, he offered explanations for his decision that were perfectly credible and even admirable, but only if you thought that there might be things more important to him than making even more money and extending his brand another few inches. It says more about the culture than about Chappelle himself that a lot of people found it easier to conclude that he must have lost his mind. 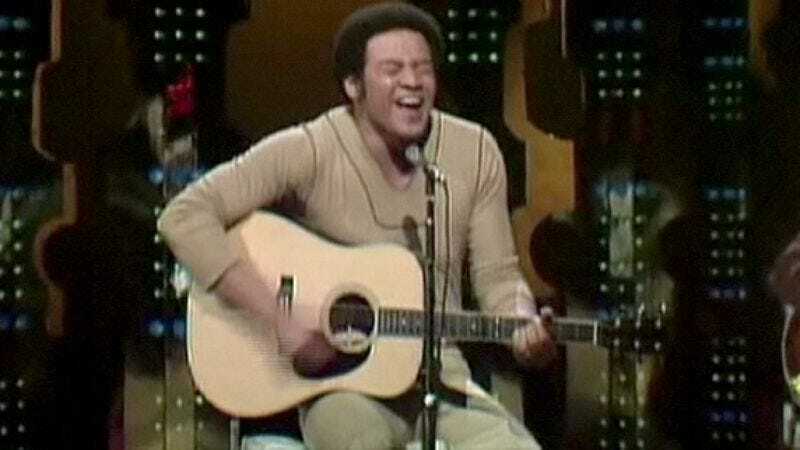 When the singer-songwriter Bill Withers disappeared from the music scene in the 1980s, it wasn't that kind of gossip-inspiring event. Like everything else about the man, it was deceptively quiet. Withers had hit it big with his first two albums, Just as I Am (1971) and Still Bill (1972) and the hits they produced ("Ain't No Sunshine," "Lean on Me," "Use Me"), and then, after a triumphant appearance at Carnegie Hall, a string of lesser albums, and a guest vocal on Grover Washington, Jr.'s Grammy-winning "Just the Two of Us," it was as if he'd been airbrushed out of the pop landscape. There were no dirty-laundry interviews or press releases citing personal problems, and his classic songs never vanished from the radio. But at a certain point, it was like realizing that the guy in the office next door who'd gone on vacation 15 years ago had never come back. Damiani Baker and Alex Vlack's documentary profile Still Bill catches up with Withers, now a sturdy-looking, gray-haired man who turned 70 during the filming, and gives him a chance to reflect on his life and career from the sanctuary of the house that "Lean on Me" built. Withers, who grew up "an asthmatic stutterer" in Slab Fork, West Virginia, was a self-motivated late bloomer who was in his early 30s when he decided that "it would be awfully nice to get into the music business." From the sound of it, he broke in practically over the business' dead body, spending his own money on the demos that got him at a deal with the small Sussex Records label. The unconventional freshness of his music and the laid-back strength that he conveys in clips from his tour of the talk show circuit must have both been partly the result of his having entered show business through a side door after having lived a little. (Recalling the effects of sudden fame, he says that, "New words started to enter my life that had never been there before, like 'handsome.'") For some people, that would have made fame seem that much more precious, but for Withers, having lived so long without it seems to have made fame seem that much easier to give up. In one old clip that now has the weight of prophecy, he tells Johnny Carson that, when he made the decision to go for it, he wasn't too worried about the prospect of failure, because "I got this good job making these toilets, [so] I don't need these cats." Withers's problems began when Sussex imploded and he landed at Columbia, besieged by what he calls "blacksperts," white music executives who wanted to help him "tap into" his "black psyche." (At one low point, he was urged to cover Elvis Presley's theme song for an imaginary Lifetime TV movie, "In the Ghetto.") Mostly, he was being told that he couldn't get away with using the kind of "uncommercial" techniques that had made his first records commercial smashes. Finally, Withers, who sums up his childhood with the words, "I grew up with 'You can't do nothing,'" walked away from a career hobbled by compromises and bonehead interference because he accepted the suits' logic that it was the only kind of big career he could have. "Do you know how unhappy you would be if you thought that the way you are is not OK? I started out my life like that. I don't want to end it up like that." He's clearly still angry about it, and just as clearly, he doesn't want to be seen as a bitter man who's not entirely at peace with himself. What's less than clear is who he's angrier at, the suits or himself. Withers married in 1976 and had a couple of kids, and for years, he had the pleasant distraction of raising a family, but the film crew seems to have shown up in time to catch him in a state of flux. There are indications that he's kept writing songs, but his home recording studio has been sitting idle, and he refers to the equipment as "all the stuff I don't know how to work." ("I mean, I guess the stuff works. I know how to turn it on, you know. I can make lights come on and stuff.") He makes his first half-step back onstage in ages at a Hal Willner-produced tribute concert, sidling up next to James Blood Ulmer and singing "Grandma's Hands". At the same time, he keeps assuring the camera that he knows his time is past, and that he's good with it. His body tells a different story, but the prospects of failing and looking ridiculous must mean more to him than they used to, now that he has a legacy to protect. Still Bill might have been better cut to a tight one hour; at 78 minutes, it's a little long, because the last section, with Withers deigning to collaborate on a song with Raul Midon and coaching his daughter, Kori, on her singing, is wobbly. The filmmakers must have wanted to end on an upbeat note, but the footage is too baggy and inconclusive to give you cause for hope that Withers, who couldn't make nice with the big record companies, might have enough juice and adaptability left to find a way to take advantage of the brave new world that's made big record companies close to irrelevant. It just isn't as interesting as listening to his war stories and watching him simmer in his own conflicted feelings. (He breaks down a little and sobs while working with Kori, which, coming after a moving scene in which he tears up while addressing the students at a school for kids with stutters, burdens the film with one crying scene too many.) But the first hour is eloquent in its handling of a great, underexplored subject: the tension between a performer's desire to forge a bond with his audience and his need to hang onto some of his self-respect, which is threatened in every negotiation with the people who are looking to make money off that bond.